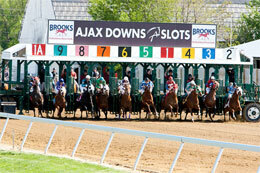 Ajax Downs hosted two trials Tuesday for the All Canadian Futurity. AJAX, ONT�JULY 9, 2013�Making his third career start, Wayne and Carol Procter's Cold Hearted Shark exploded late to defeat Silken Memories by a neck and post the top qualifying time for the All Canadian Futurity at Ajax Downs. The 10 fastest two-year-olds, owned by Canadian residents, who posted the top times from two trial races on Tuesday will return to the Ontario racecourse on July 30 and vie for the winner's share of $40,000-added purse over 350 yards. Jockey Erika Smilovsky rode Cold Hearted Shark to victory in the fastest time of :17.760 seconds in the first trial. Wayne Procter conditions the WAVE CARVER gelding out of Shesa Cash Snatcher, by Strawflyin Buds. The Oklahoma-bred gelding entered the trial off two-second place efforts at Remington Park last April. Rick Sumner is the breeder. For the complete list of All Canadian Futurity finalists times, sires, dams, owners, breeders, trainers and jockeys CLICK HERE. Editors note: A photo of the fastest qualifier will be posted as soon as it becomes available from the track photographer.